The Durbin Rocket was a logging train that worked out of Durbin, West Virginia. Today, it mission is to give tourists an up-close view of the East Fork River and the experience of a smoke-puffing, cinder-showering steam locomotive train ride. At a top speed of five miles per hour, it is a leisurely one-hour ride along the river. The train stops long enough for everyone to get off and explore an especially nice area of the river. At the slow speed, I was able to check out all of the cars, including riding in the top of the caboose—great views. The train makes two trips each day, so it is possible to ride the train out in the morning and catch the afternoon run back to Durbin. Many people take the ride out to spend the day picnicking, fishing or hiking. This photo was taken during the return trip. Rounding the bend allowed me to see all of the train—from the train. This is what early 1900s train travel was like. 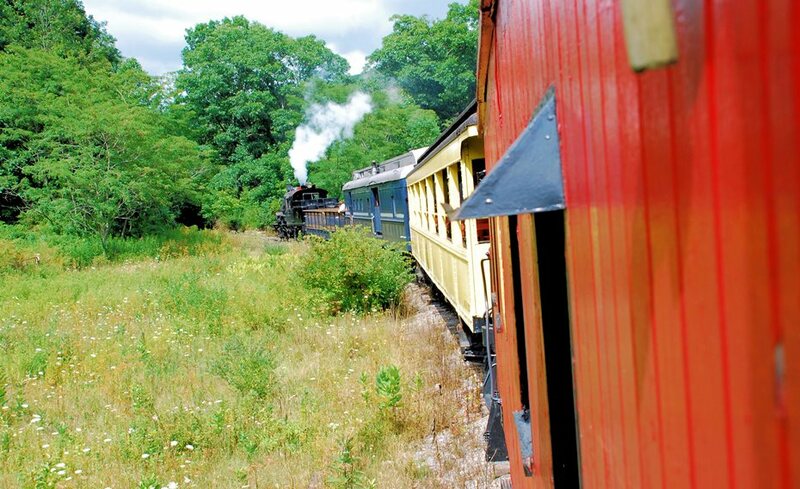 This entry was posted in Photo of the Week and tagged Durbin, East Fork, ride, steam, train, West Virgina. Bookmark the permalink. Looks like something I’d enjoy! We look for train rides whenever we can. The Durbin Rocket and the Cass Scenic Railway nearby are favorites. Just relaxed fun.